Located at 100 Gun Club Road, the Training & Event Center offers full facility or split level rental options for all your event needs. 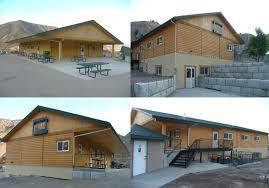 Facility Rentals are daily from 8AM to 8AM the next morning. Confirmation of date will be given upon the EVRGC receipt of the completed and signed Clubhouse Rental Agreement and deposit. All fees and deposit must be paid in full at least 30 days in advance of confirmed event date, unless prior arrangements have been made with the Eagle Valley Rod and Gun Club. All supplies and equipment related to your event can only be brought in the day of your event and must be removed the day of your event, unless written requests have been approved in advance. Please ensure all proper forms for event are completed with the Event Center Coordinator, Chris Huffman.